A quilt exhibition will be held this Saturday 1 November (8am-2pm) at Kincumber Uniting Church (on the Central Coast north of Sydney)in conjunction with the popular monthly car boot sale. On the day, there will be a mix of quilting groups, busineses and quilts from private collections and commmunity groups. Devonshire teas will also be available. Japanese quiltmaker Sanae Hattori will be giving a presenation of her beautiful quilts and kimono at the Guild office on Wednesday, 5 November at 10am. Space is limited so please telephone the Guild office (Tel: 02 9283 3737) to reserve your place. Sanae Hattori studied Japanese embroidery at Joshi Bijutsu (Women's College of Fine Arts) in Hachioji, Japan, and concentrated on traditional design. In 1978 she founded SANAE Art Studio, and began reconstructing Japanese classical designs by using American patchwork techniques. Hattori's quilted uchikake have since become internationally famous. An exhibition of fine art quilts shows at Braemar Gallery, 103 Macquarie Rd, Springwood in the Blue Mountains from 31 October to 7 December 2008 (Friday, Saturday, Sunday 10am-4pm). You are invited to attend the opening of the exhibition on Saturday 1 November at 2pm. The guestspeakers will be Simon Ambrose, the Director of the Blue Mountains Cultural Centre, and textile artist, Dianne Firth, who is the guest artist and who has selected this exhibition. Gees Bend Quilts @ Canterbury Next Week! NSW quilting enthusiasts are in for a treat next week. An amazing display of more than 200 international quilts to be hanging from 31 October to 2 November at the Canterbury Racecourse, Canterbury as part of the Quilt Indulgence Festival presented by Guild sponsor Creative Living Media (publisher of Down Under Quilts). The quilts include art quilts from Gees Bend USA, charming quilts from France, extraordinarily-executed quilts from Japan, and fabulous quilts from New Zealand and around Australia. The creators of the quilts from Gee’s Bend are four generations of African American women isolated for decades by geography, outside indifference, and extreme poverty. Their lives were and are rich with family, faith, and community, and they have quietly created one of the most astonishingly beautiful and original bodies of artwork. This is the first time any of these quilts have been seen in Australia, and only the second time outside America. 10-4 daily – Canterbury Racecourse. Free parking, free shuttle bus from Canterbury station. Australian Patchwork & Quilting and Expertise Events are both generous sponsors of the Sydney Quilt Show. Now Australian Patchwork & Quilting and the Australasian Quilt Convention, in conjunction with Expertise Events, present their new and exciting quilt competition – the 2009 AP&Q AQC Challenge. With three generous cash prizes to be won including $5,000 first prize, $2,000 runner-up and $500 for the best entry by a quilter under eighteen years of age – quilters best stop fantasising and start quilting! 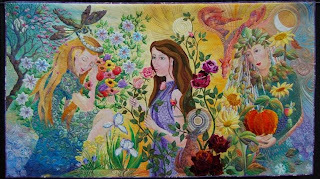 The theme for this year’s challenge is FANTASY and is sure to inspire some magical and imaginative quilts. Entrants may choose a traditional or contemporary approach to their quilt and will be judged on their interpretation of the theme, excellence in design and craftsmanship. A selection of up to thirty finalists will be chosen to form the FANTASY exhibition which will be displayed over four days, February 26 – March 1 2009, at the Australasian Quilt Convention at Melbourne’s Royal Exhibition Building in Carlton – with winners announced at the event on February 28. The exhibition of quilts will then embark on a nationwide tour throughout 2009, travelling exclusively with the Craft & Quilt Fairs. Entrants are provided free reign with quilt design and may apply techniques including piecing, appliqué, embroidery, whole cloth and/or manipulated fabric. Any materials may be used but the final result must be flexible in nature and consist of three layers of fabric held together with stitching. the appointment of the auditor. The Quilt Study Group of Australia's 'Sharing our Legacy' seminar, which is held every two years, will be in Brisbane between the 17th and 19th of October. It will start with an informal dinner on the 17th October followed by Saturday's full day of presentations by speakers such as Annette Gero, Margaret Rolfe and Pam Holland plus a number of Queensland presenters on local topics of interest to us all. At the same blog address, the current newsletter which contains more details on the agenda and presentations can be downloaded. What's more, Helen Godden has been advised that all three of her quilts have been awarded a prize including Three Sisters which has been awarded a top level prize. Keep a lookout on the IQA website to see when the winners are announced later in the month. Offering an array of superb handmade gifts. A variety of shops will be there to cater to everyone's needs. Delicious morning tea, lunches and afternoon tea will be available both days. The proceeds of this year's raffle will be donated to Wollongong Women's Refuge. Guild member Brenda Smith belongs to the Twelve by Twelve Collaborative Art Quilt Project, an international group of twelve quilt artists who have embarked upon an online art challenge together. Every two months, they each make a small quilted art piece -- 12 by 12 inches – based on a theme chosen by each member in turn. The 12x12inch/30cm square format offers plenty of scope for exploration and experimentation. Don't forget that entries for the Guild's calendar challenge close on 28 November 2008. 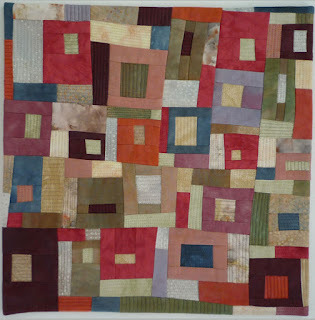 Entry is limited to individual financial Guild members and quilts (3 layers) must be 30cm square. Details and entry form in the September newsletter. 14 Alma Rd, New Lambton, NSW.